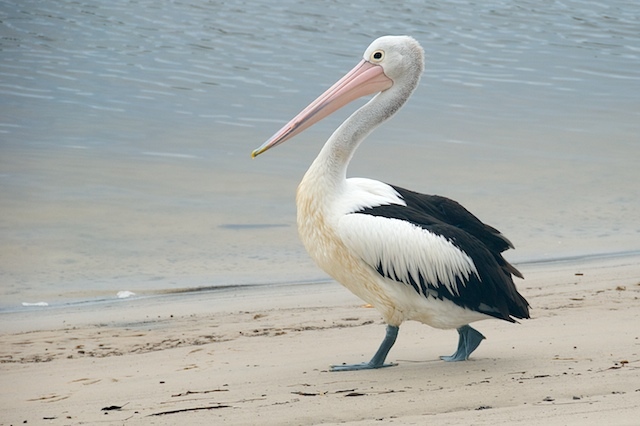 I'm fairly sure this bloke is a pelican, but we've never been formally introduced. He's been hanging round for around eight years give or take, and occasionally brings a mate or two, but only he calls our place home. If we walk down to the lawn he'll swim over and walk up to what he considers to be a safe distance, expecting us to feed him I guess, but we never do. Or maybe just once or twice we have when we have had a small fish at hand. There always seems to be a shortage of pelican food when we go to Aldi. He disappears for a month or two in winter presumably to try his luck out west at a B&S ball. He was grubbier than usual today, I'm not sure whether it's a bit of diesel or just dirty foam after the rain, perhaps I could have used a picture I'd prepared earlier, but I rather like telling it as it is today. Not a good day, hey? I suspect the sooner you are on your way the better. The Main Roads can say more on Turesday, right? I sold my flat a few years ago and put it all in my super and now pay myself a pension out of that. I simply pay rent. Gives me a lot of freedom and possibly two trips OS a year. Did you know that somewhere (Florida, I think) in the world there are smaller brown pelicans? We had some friends visit from Texas the year before last, (which is when we last fed the pelicans), and they were entranced by the size and the sheer whiteness of the pelicans at our place.